Sounds a bit like a Brave New World, doesn’t it? At InVision, we have embraced the No Management organisation model and we are already reaping the rewards. More importantly, so are our customers. What does an organisation without a traditional management hierarchy look like and could you apply the principles to your organisation? It’s true that most companies still have a hierarchical organisation structure. At the top is the CEO, then the rest of the C-level, then middle management and finally the employees who perform the actual work. The organisation is usually depicted as a pyramid, with the boss at the top and the humble employees at the bottom. The bigger the company, the more tiers of management seem to be needed. This form of organisation goes back centuries. It takes in elements of Adam Smith’s Division of Labour (18th century) and FW Taylor’s Scientific Management (early 20th century), which assume that efficiency and productivity are improved by increasing specialisation, reducing individual autonomy and doing work in a rigid, repetitive way that requires minimal creativity or initiative. The result: a company that is fragmented into departments, each inward-looking and focused on its own rigidly-defined goals. Those of us who have worked in call centres will have experienced the dis-economies of a silo organisation; For example, how often does Marketing ‘forget’ to tell Operations about the launch of a new advertising campaign? 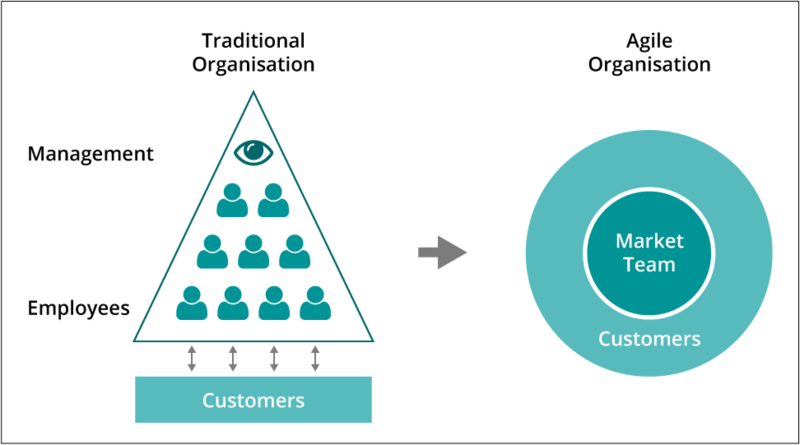 But the problems of the traditional hierarchical and segmented organisation don’t end there. To be blunt, in today’s post-industrial, knowledge-based economy, Taylorism simply doesn’t work. A rigid silo organisation is woefully inefficient. This post explains what No Management looks like, how we have adapted to it - and why this is a good thing for our customers. At injixo, every employee is empowered to act independently in the best interests of the company and our customers. We have introduced a completely flat organisation without hierarchy or job titles, adopting the #NoManagement principle. Our people don’t wait for instructions from superiors, perform tasks by the book every time or have to create complex workarounds for out-of-date processes. Teams are trusted to work together to find the best possible solutions to problems - and to put them straight into action. Suggestions for improvement go from brainwave to implementation quickly, without waiting for a long approval process to run its course. Until quite recently, we ran our company in hierarchical silos just like everybody else. Following the received wisdom, we expected that lots of specialisation would result in a robust and efficient operation. We believed that more specialisation would result in even more efficiency. For example, we thought that it wasn’t good enough to have the role of Consultant; we needed Technical Consultants, Junior and Senior Application Consultants, Project Managers, Pro Services Directors and so on. But then we realised that any role definition limits flexibility to respond to the needs of the business and its customers. For example, an Application Consultant might have been qualified as a Project Manager or have had a successful Sales background - but he was not allowed to jump in as and when needed because the task did not fit his role definition. This lack of flexibility and agility was bad for customers - and ultimately for the company. Apart from certain central functions like Finance, we have completely abolished departmental structures and hierarchy. For example, in each region, we simply have a Market Team. This team is empowered to do what is needed to delight existing customers and attract new ones. Depending on the nature of the task, the team member best qualified makes the decisions and takes care of delivery. The job is done by the most appropriate employee - not the one with the most appropriate job title. For years we have been explaining the pooling efficiencies that flow from having a multi-skilled workforce. Now we are practising what we preach. Hierarchy leads to slow decision-making, which in turn creates frustrating delays for customers; skilled employees have to wait for a ‘manager’ to make a decision, even though they have the best knowledge with which to make the right choice. The Market Team organisation means that we can be more agile when reacting to customer demands by making decisions better and faster. Better - because all employees in Market Teams communicate directly with customers without needing to go through, e.g. a Project Manager. Team members can react flexibly to find the best solution based on first-hand knowledge of the customer’s situation, having openly discussed the issue within a multi-disciplined team. Of course there are rules, but they are limited to essential technical details such as the handling of sensitive data. But everything else is decided collaboratively. We no longer even have holiday allowances; Market Team members work together to ensure that holidays can be taken when desired without creating an under-staffing situation - another lesson from the world of WFM! Faster - because decisions can be made without the need for unnecessary layers of management. Unlike in hierarchical organisations, at injixo there is no management pyramid and the idea of an ‘escalation path’ makes no sense. Why would it? No one understands customers better than the Market Team members who interact with them every day. Team members are empowered to deliver the best solution without the need for management approval. The first part of injixo to adopt #NoManagement principles were the product developers. The whole company has made the transition and already we are seeing gains in employee - and customer - satisfaction. ‘Senior Global Chief Executive VP Head of Everything’ sounds amazing. But it’s not for us. Don’t be confused when you don’t see a job title in our email signatures or on our social media profiles. At injixo, we are each part of a multi-disciplinary team, all passionate about WFM and all focused on making sure that our customers love being part of the injixo community. You can learn more about the #NoManagement trend here and here.